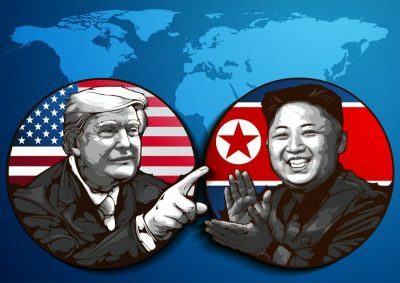 “Killer Diplomacy”: The Kim-Trump Summit in Hanoi, Sabotaged by Mike Pompeo? Polite diplomacy over the dinner table. Smiles on both sides. A nice private dinner. “Everybody is having a good time. Hope so”, says Trump. “We have exchanged in a very interesting dialogue with each other for about 30 minutes”. Trump responds with a smile “yes it was good”. “So we’re going to have a very busy day tomorrow, says Trump. “And a lot of things are going to be solved. I hope. and I Think it will lead to a really wonderful situation long term… And our relationship is a very special relationship”. Ultimately, however, there was no official statement or joint communique. What happened. What went wrong? Prior to the Hanoi encounter, Trump intimated that if a moratorium on nuclear missile testing by the DPRK was reached, he would be satisfied. And that this commitment would then lead to subsequent negotiations. Who are these “Senior Trump aides”? The WPo fails to mention the central role of Secretary of State Mike Pompeo who was put in charge of the negotiations from the very outset in 2017 when he was head of the CIA. While we are not privy to what was discussed behind closed doors (with the two leaders and their senior advisors), or what was discussed by Pompeo and Kim Yong-chol in meetings prior to the Hanoi venue, there is evidence that Pompeo was instrumental in the sabotage of peace negotiations both in Singapore and Hanoi. From the outset the DPRK does not trust Washington’s Peace Negotiator. Pompeo should be removed from the peace negotiation process which eventually requires the repeal of the 1953 armistice agreement and the signing of a peace agreement with the DPRK and China. 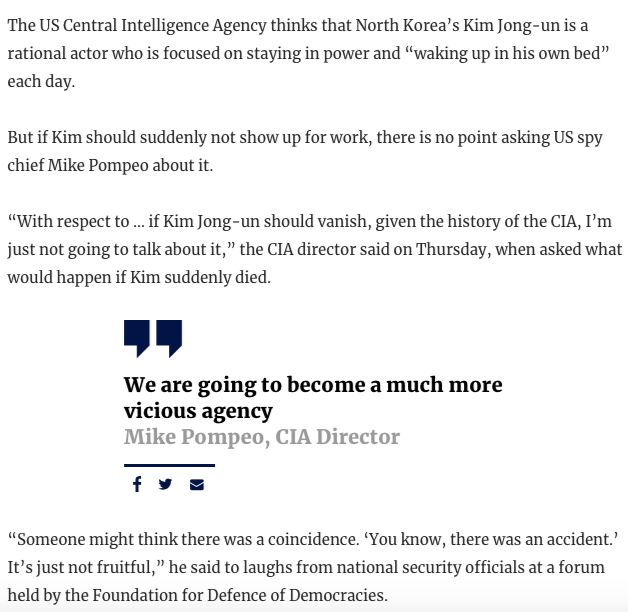 In a bitter irony, the same Mike Pompeo who casually refers to the “CIA history” of political assassinations, had come to play a central role in “peace” negotiations together with his North Korea envoy, Stephen Biegun. Pyongyang was fully aware of the assassination list. But Pompeo deliberately chose to make it public prior to the conduct of negotiations with a political leader who is on the CIA hit list. This is tantamount to saying to Kim: “Lets negotiate but I want to kill you”. Not surprisingly, in the followup US-DPRK negotiations with Pompeo held in Pyongyang in the wake of the Singapore Summit (June 12-14, 2018), the DPRK accused the Trump administration of pushing a “unilateral and gangster-like demand for denuclearization.” The statement was directed against Pompeo who was in charge of the negotiations on behalf of president Trump. Flash Forward to Hanoi, February 27, 2019: Both leaders expressed their optimism “for continuing the great dialogue”. Acknowledged by Trump, the DPRK has not fired a single nuclear ballistic test missile since late 2017. “To me, I very much appreciate no testing of nuclear rockets and missiles,” Trump added. Prior to the final wrap-up session, the two leaders had a fruitful “one-on-one meeting” of about 45 minutes. (“Senior political aides” feared the one-on-one session which provided leverage to Trump to strike a deal with Kim, as reported by the WaPo, see above). 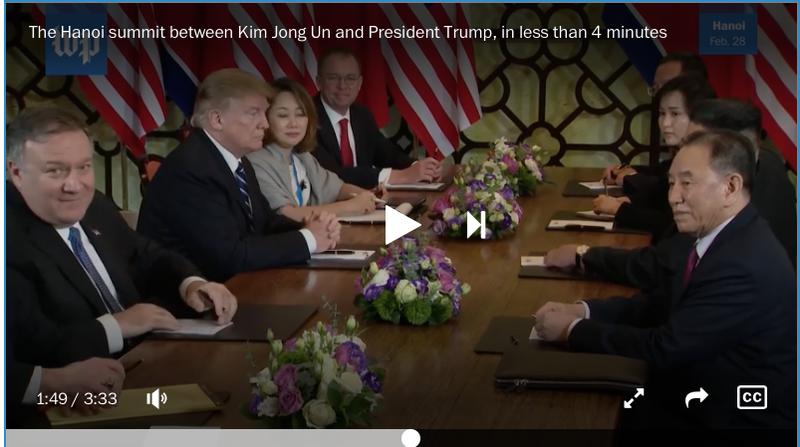 And then there was an about-turn at the final session attended by Secretary of State Mike Pompeo and DPRK’ vice chairman of the Workers Party of Korea (WPK) Central Committee Kim Yong-chol. On the US side, this outcome had been planned well ahead of the Hanoi venue in Washington in consultations with the CIA, State Department and Pentagon including National Security Advisor John Bolton. Nothing concrete emerged. Why did things go wrong? The meeting behind closed doors with senior advisors (and translators) led to an impasse. The US failed to provide anything in exchange for the DPRK’s commitment to denuclearization. Did Pompeo play a central role in deliberately sabotaging the peace process at the wrap up session behind closed doors? No final communique. The US refused to lift the sanctions regime. “Basically they wanted the sanctions removed in their entirety and we could not do that. They are willing to denuke a large part of the areas we wanted. But we could not give up all of the sanctions”, said Trump. Trump’s statement regarding the removal of the sanctions is a lie. The DPRK had requested the partial removal of sanctions and that request was turned down. See Foreign Minister’s statement below at DPRK press conference. “What we have asked for was partial lifting of sanctions, not entirely. In detail, we asked to lift five sanctions that were imposed within 2016 and 2017, out of a total of 11 sanctions, which would affect ordinary people’s economy and life,”( Statement of the DPRK Foreign Minister Ri Yon-ho).